Soy sauce skateboards? Yes, that's right. Kikkoman-licensed skateboards on display at Zumiez, a skateboarding fashion store in the Janesville Mall. Zumiez now carries skateboards and apparel that soy sauce maker Kikkoman, which has roots in Walworth, launched recently through a partnership with a U.S. skateboarding company. Lawrence Meyer, store manager of the Zumiez store at the Janesville Mall, unwraps a skateboard shaped like a Kikkoman soy sauce bottle. Kikkoman is one of the biggest names in the world of soy sauce, but the Japanese company with roots in Walworth is now making a name in the world of skateboarding. Kikkoman Foods has had local significance because its U.S. production headquarters, home of a big share of production of soy sauce and other ingredients in Kikkoman’s North American market, has since 1973 been located in Walworth. Locals might think they know soy sauce, but they’ve never seen the sauce dished out quite this way. 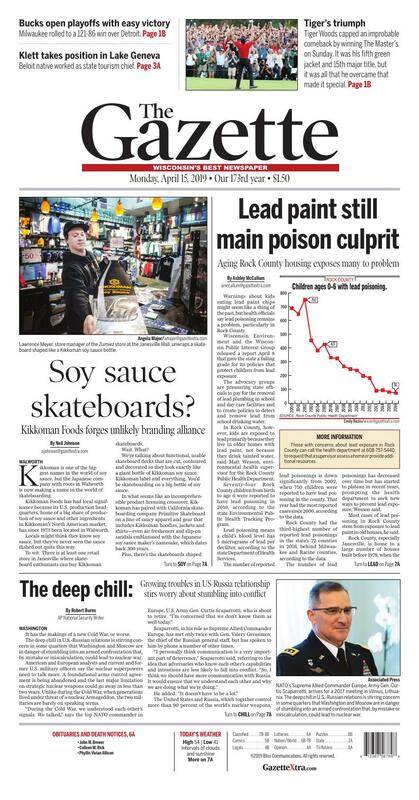 To wit: There is at least one retail store in Janesville where skateboard enthusiasts can buy Kikkoman skateboards. We’re talking about functional, usable skateboard decks that are cut, contoured and decorated so they look exactly like a giant bottle of Kikkoman soy sauce. Kikkoman label and everything. You’d be skateboarding on a big bottle of soy sauce. In what seems like an incomprehensible product licensing crossover, Kikkoman has paired with California skateboarding company Primitive Skateboard on a line of saucy apparel and gear that includes Kikkoman hoodies, jackets and shirts—even air fresheners and slip-on sandals emblazoned with the Japanese soy sauce maker’s namesake, which dates back 300 years. Plus, there’s the skateboards shaped like Kikkoman dispensers. Again, that’s a thing. Right now, the Kikkoman skateboards are on the shelves at Zumiez, a youth and young adult clothing shop that caters to skateboarding and skateboarding culture. Zumiez has a location at the Janesville Mall. Lawrence Meyer, manager of the Zumiez store in Janesville, said his store got Kikkoman skateboards shipped in a couple weeks ago. He said there’s resurging interest in youth culture for apparel that showcases circa-1990s Japanese anime cartoon characters, along with other name brands, such as Starter sports apparel, that were cultural touchstones in the 1990s, but waned in fashion years ago. Meyer said Kikkoman, on the other hand, strikes him as a stalwart consumer brand that transcends nostalgia and retro-kitsch. “Kikkoman seems like the Coca-Cola of Japan. It’s a classic brand you’re just going to recognize. And the company’s logo has cool script, too,” Meyer said. Still, he never expected to see skateboards shaped like soy sauce bottles. He likes the idea of selling products that advertise something else that’s made locally. It’s a connection Meyer called “sick,” which is a looser way of affirming something is “good”—or in this case, possibly advantageous to his making sales. When reached by The Gazette, officials at Kikkoman’s Walworth headquarters weren’t familiar with the company’s crossover into youth skateboarding culture and merchandising. It took a few calls to Kikkoman’s U.S. sales headquarters in San Francisco, then to Tokyo, Kikkoman’s world headquarters, to get solid answers on Kikkoman’s decision to kick its way into the skateboarding market. Kinya Igarashi, a marketing official who works in Kikkoman’s foreign operations department in Tokyo, knew all about the partnership and also was aware of Kikkoman’s major manufacturing presence in Wisconsin. Igarashi said Kikkoman has gotten into licensing deals to put its name on shirts and other apparel in the past, but the Primitive deal is the first time Kikkoman has licensed an entire line of clothing and gear, let alone skateboards. Igarashi said the partnership has been in development since 2017. Now, retailers such as Zumiez are featuring Kikkoman shirts, coats and slide sandals in their merchandise catalogues, alongside skateboarder favorite brands such as Vans, Converse and Union Bay. Igarashi said the crossover makes sense because it’s rooted in “street culture” in both the U.S. and Japan. “At first, it may seem that skateboarding culture has nothing to do with soy sauce,” Igarashi said. “But when you look at skateboarding as a part of street culture, it makes sense. Food ... and seasoning ... is also a part of street culture—a large part,” Igarashi said. As for soy sauce bottle-shaped skateboards? We checked on whether Zumiez was still saucy with the skateboards. As of late last week, the Janesville store still had some of the Kikkoman boards in stock. NATO’s Supreme Allied Commander Europe, Army Gen. Curtis Scaparrotti, arrives for a 2017 meeting in Vilnius, Lithuania. The deep chill in U.S.-Russian relations is stirring concern in some quarters that Washington and Moscow are in danger of stumbling into an armed confrontation that, by mistake or miscalculation, could lead to nuclear war. Warnings about kids eating lead paint chips might seem like a thing of the past, but health officials say lead poisoning remains a problem, particularly in Rock County. Wisconsin Environment and the Wisconsin Public Interest Group released a report April 8 that gave the state a failing grade for its policies that protect children from lead exposure. The advocacy groups are pressuring state officials to pay for the removal of lead plumbing in school and day care facilities and to create policies to detect and remove lead from school drinking water. In Rock County, however, kids are exposed to lead primarily because they live in older homes with lead paint, not because they drink tainted water, said Matt Wesson, environmental health supervisor for the Rock County Public Health Department. Seventy-four Rock County children from birth to age 6 were reported to have lead poisoning in 2016, according to the state Environmental Public Health Tracking Program. Lead poisoning means a child’s blood level has 5 micrograms of lead per deciliter, according to the state Department of Health Services. The number of reported lead poisonings is down significantly from 2002, when 750 children were reported to have lead poisoning in the county. That year had the most reported cases since 2000, according to the data. Rock County had the third-highest number of reported lead poisonings in the state’s 72 counties in 2016, behind Milwaukee and Racine counties, according to the data. The number of lead poisonings has decreased over time but has started to plateau in recent years, prompting the health department to seek new ways to prevent lead exposure, Wesson said. Most cases of lead poisoning in Rock County stem from exposure to lead paint in old houses, he said. Rock County, especially Janesville, is home to a large number of houses built before 1978, when the federal government banned the use of lead paint. Many of the older homes in Janesville are rentals, which sometimes are not well-kept and pose risks for lead exposure, Wesson said. Lead exposure often occurs when part of a house—such as a window—sees a lot of friction, and paint comes off in fine chips or dust, thus exposing old layers of paint and moving the old paint dust around the house. Young kids then come in contact with the dust and accidentally consume it, Wesson said. He recommends that parents ask their pediatricians to test children for lead exposure at regular checkups or if they think their children are at high risk for exposure. Lead poisoning can happen to anyone, but it can be particularly damaging to children younger than 6. Lead poisoning can affect mental and physical development which, if stunted at an early age, can have life-long consequences, Wesson said. Lead poisoning does not have any immediate, visible symptoms, however, which is why Wesson recommends regular testing by pediatricians. When doctors report a confirmed case of lead poisoning to the state, the state contacts the health department to do a follow-up with the family to identify lead sources in the home and recommend solutions, Wesson said. The health department allows supervisors to visit homes to look for lead and provide additional resources. Those with concerns about lead exposure in Rock County can call the health department at 608-757-5440 to request that a supervisor assess a home or provide additional resources.